Somebody is buying millions of booksabout men and their pain. Whatever men do these days, they don’t feel masculine enough. They try to feel more masculine by competing harder over practically anything from pecker size to watch price to long-distance spitting. They try to control whatever is within their realm, whether it be their own emotions or other people’s sexuality. Those who aren’t out to prove their masculinity by sleeping around are hoping they’ll find a woman who knows how to make them feel manly enough. But those who try to get their sense of themselves from women are in deep trouble. Why? Because women are pissed. They’ve been deserted by fathers, betrayed by husbands, assaulted by strangers, and exploited by bosses, all of whom were just doing what a man’s gotta do to feel like a man. We all saw Thelma and Louise and heard the cheers from the audience: Women are through being cheerleaders for the games men play. Men are getting confused. We do what we’ve been taught was masculine and no longer get applause for our successes or sympathy for our failures. It ought to be obvious that men should look to other men for reassurance and direction, but men don’t have friends anymore. We don’t dare expose our shortcomings to other guys–they would get uncomfortable and ridicule us just as they did in adolescence. And if they were kind and loving, our own homophobia would cause us to recoil. Most of us haven’t really felt close to another guy since we started growing up. We need a men’s movement, not to protect us from women, but to bring us together and help us figure out what to do with our masculinity, to keep us from wasting our lives and destroying the world around us. Do we have a men’s movement yet? We read in all the magazines about otherwise normal men going out into the woods, beating drums and crying together about how their fathers and their ex-wives didn’t love them as much as their mothers did. And somebody is buying millions of books about men and their pain. At the center stands the strong, reassuring figure of Robert Bly, who chants and beats a dram and tells fairy tales about growing up male. His benign countenance has been on the cover of various magazines, and everyone has decided he is important enough to write about, but they don’t seem to know whether to take him seriously or not. He dresses funny and sounds more like a poet than the leader of a psychosociopolitical movement. Unfortunately, the whole men’s movement has been viewed in terms of Bly and dismissed as silly. For example, Esquire—“the magazine for men”–put out a special issue about the men’s movement entitled “Wild Men and Wimps.” Its savage mocking of a Wild Man weekend concludes that “the men’s movement seems mostly a therapeutic circus of monied fellows” who “lost their souls on Wall Street or during a feminist march”–a bunch of white, educated American men “spending money to make themselves feel good.” To the young Esquire writer, the pain of monied white men is beneath contempt. The magazine declares, in effect, that it is unstylish for the male mainstream to be concerned with their masculinity yet. For Esquire, Time, and even the Utne Reader, which offers the best of the alternative press, it’s all a skit fight out of Lord of the Flies. 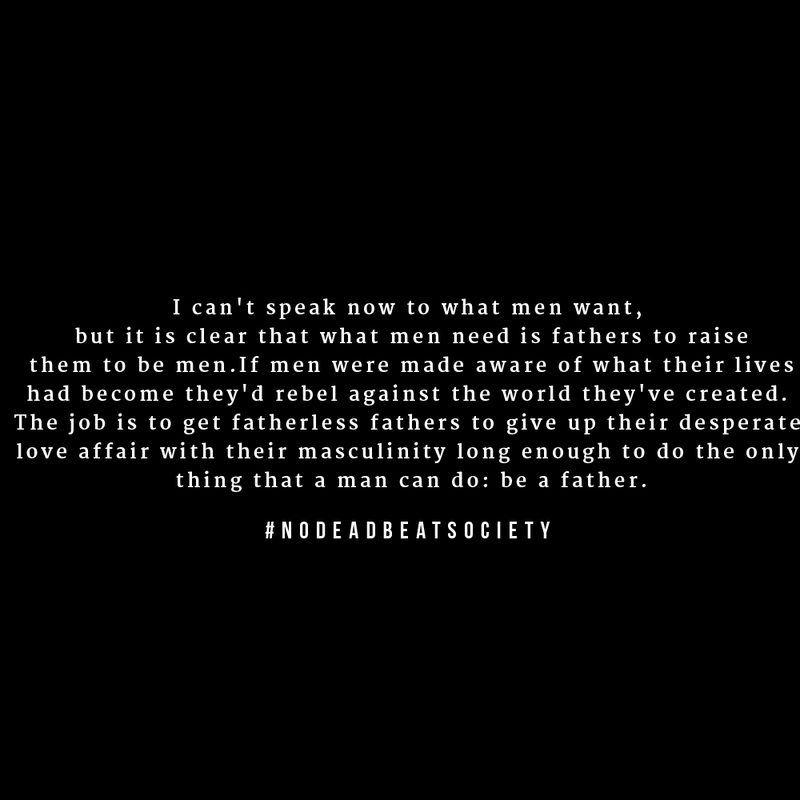 I can’t speak now to what men want, but it is clear that what men need is fathers to raise them to be men. If men were made aware of what their lives had become they’d rebel against the world they’ve created. The job is to get fatherless fathers to give up their desperate love affair with their masculinity long enough to do the only thing that a man can do: be a father. This article was written in 1992 and has been featured on Psychology Today in 2012. Frank Pittman (RIP 2012) was a brilliant man. This article should be a lesson for all of us. Previous PostMy son, your woman should treat you like a king.